California-based heavy rock band THE WATCHERS are starting the new year in the very best way possible, with new music. Well, in this case, “new” like, right now this minute, as the band takes on an Ozzy Osbourne classic. “Believer” dates back to 1981’s sophomore album outing from the Ozz-man, ‘Diary Of A Madman‘, and was originally recorded by Osbourne, guitarist Randy Rhoads, drummer Lee Kerslake, and bassist Bob Daisley. It would be the last recorded work of Randy Rhoads, of course, who was tragically killed in an airplane accident just four months after its release. Now another quartet, one from the contemporary age of music, THE WATCHERS – vocalist Tim Narducci, guitarist Jeremy Von Epp, bassist Chris “Cornbread” Lombardo, and drummer Carter Kennedy – add their unique touch to the song. The guys stay pretty close to the original version, keeping things true in their playing results in the channeling of this ode to self-empowerment a steadfast and serious affair. 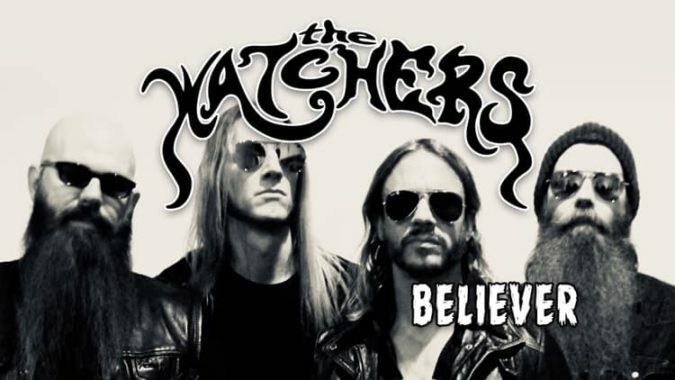 THE WATCHERS recorded “Believer” while in the studio laying down their most recent album, the critically acclaimed ‘Black Abyss‘, released via Ripple Music in March 2018. Although the band’s Tim Narducci produced the stand alone “Believer” single, their latest full-length record has its very own connection to the landmark Ozzy outing, ‘Diary Of A Madman‘. Though the span of time between the pair of releases is a couple years short of four decades, the same man sat behind the boards producing them both, the famed Max Norman. Here is your shot to do exactly that as Riff Relevant is excited to share THE WATCHERS‘ version of “Believer“. Enjoy it below and of course, have a Happy New Year in 2019! Purchase ‘Black Abyss‘ on iTunes [HERE], along with THE WATCHERS‘ 2016 EP, ‘Sabbath Highway‘ [HERE].